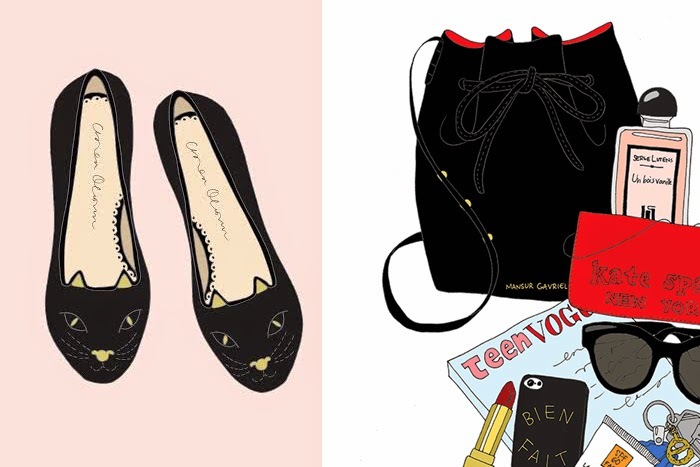 How did you get into fashion illustration? I've always been interested in art since I was little so at University I decided to study traditional art. I learned techniques such as charcoal drawing and oil painting and really perfected my craft. It was really fun to learn all of these old school techniques and work on my creativity but once I graduated I realised being a traditional artist wasn't very financially viable. (I unfortunately wasn't a contemporary Picasso.) I still wanted to find a creative career so I researched other options for about a year and finally decided on giving illustration a try. I taught myself digital techniques such as using Photoshop to color my outlined ink drawings and I really liked the simple finished look. (I also loved that it involved no mess of using paints and if I made a mistake I can easily fix it on the computer.) In art school I could never really find my style or figure out what I wanted to paint, this was a constant struggle. When I started to just sketch simple perfume bottles and makeup products for practice I realised how much I enjoyed it and thought they were really pretty too. I thought if I really loved them other girls like me would love them too. So EmmaKisstina was born. Which artists inspire you? I'm really inspired by traditional artists from the Roccoco & Neo Classical period. I love the soft romantic colors and textures of their oil paintings. I think they really inspire my illustrations even though I illustrate in a much simpler contemporary style. Who is the EmmaKisstina girl? An EmmaKisstina Girl is a girl of any age who appreciates the happy, beautiful and simple things in life. We love your 'What's In My Bag' (link) series with other bloggers? Whose bag would you love to see the contents of? I'm so glad you love the series, I love it too! I'd really love to step back in time to see what the old Hollywood stars had in their purses, such as Audrey Hepburn and Marilyn Monroe. That would be so interesting! What does a day in the life of an illustrator entail? A lot less illustrating than you might think! Responding to emails, packing orders, planning projects, contacting new manufacturers, visits to the post office, writing invoices, answering interview questions, all take away from my time drawing but I enjoy those roles just as much. Since I'm my own boss I have to make sure to not only work on the current projects that I've been commissioned to do but I also have to work on future projects and at the same time make sure to spread the word about my work. Thankfully I have a lot of discipline and really enjoy my work. Rather than not wanting to go to work I actually have to keep myself from working all the time. Which is your favourite EmmaKisstina illustration? I really love my 30 Nail Polishes print, which happens to be one of my top sellers too. I just love the cute colors and the different styles of the bottles. It's a simple, happy, and fun illustration. Career highlight? I think it's about to happen! I've finally gotten the guts to apply to Formex, Scandinavia's biggest design trade show, this coming January here in Stockholm, and I got in! I'm so excited to present my work, current products, and lots of new work on such a huge and professional platform. Finally, what advice do you have for young women wanting to do what you do? Creative fields are really difficult but it doesn't mean you shouldn't try. It took me nearly 4 years to finally go full time, and even then I really had to budget my lifestyle, still do actually. It's not only financially difficult but emotionally as well as you're your own boss and have to constantly push yourself to produce more work that not only you will love but also your customers too. It helps if you really enjoy what you are creating. It will definitely show in your work and the way you present yourself plus all the hard work will be worth it. Discipline helps as well. I recommend working hard, and make friends with people in your same field. It can get a little lonely and overwhelming when you work for yourself, especially if you work from home as I do. It's nice to have people to run over ideas with and to ask for help if needed. Also don't give up. Her book stacks are some of my favourite prints. They're all stunning though. Glad I don't have to answer this question haha. The Carrie Bradshaw whats in her bag! I am so in live with those illustrations! Thank you forbthe article, very cool! Same here! I feel like there's none I dislike really haha. Ooh. I love the Holly Golightly's Mailbox! Breakfast at Tiffany's is one of my faves!